The Beatles Through The Years: Paul McCartney & Phil Collins Feud - What's It All About, Mate? Paul McCartney & Phil Collins Feud - What's It All About, Mate? 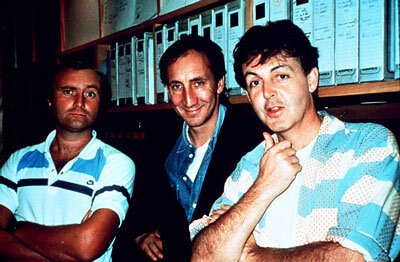 Phil Collins & Paul McCartney, seen here with Pete Townshend in the middle, in 1982. Phil Collins, Genesis drummer and solo star, has revealed that when he and Macca played the Party at the Palace for Queen Elizabeth's Golden Jubilee in 2002, Paul annoyed him. Speaking to the Sunday Times promote his memoir 'Not Dead Yet', Phil revealed an encounter which has left him feeling a little sour towards Paul. Now, Phil has a bit of a reputation as a bit of a moaner. He announced his retirement on rather a bitter note and has long derided the state of the music industry today. (To be fair to him, he's not entirely wrong on the latter issue). After Phil's comments, Paul got in touch with him via e-mail to sort it out, which Phil revealed in an interview with Billboard. "I'm afraid it happened, you know, and I'm afraid it affected me the way it did and I'm afraid I wrote about it," Collins said. "I think maybe I should just brush it under the carpet and forget about it and move on, but it did happen." "He's been in touch about it because he was upset. I certainly didn't get any flowers from him; I got more of a 'Let's just get on with our lives.' And I'm sorry he's upset that I kinda said something nasty about him -- well, it wasn't really nasty. If people don't tell people that sometimes their attitude could be a bit better then you're not gonna get any better, y'know?" Phil never revealed exactly what Paul said in the e-mail, but we can probably imagine it was mostly confusion as to why Phil never said anything about this to him before. The original quote from Paul, was, correct. Little Phil IS (or was, he may not be any more) a Beatles fan. 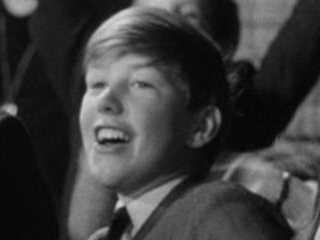 He is seen briefly as a 10 year old in the audience in the concert scene in A Hard Day's Night. Indeed, seeing the Beatles and their success may have spurred the young Phil on to a music career of his own. So, speaking from an objective point of view, I can agree with Paul. Let's just get on with our lives, Phil. What's it all about, mate? Until now I had no idea he was in that scene in A Hard Day's Night. You learn something new every day! I am a huge fan of Genesis and it's hard to hear that there is a feud going on between the two. Music is really my passion when I was young, it's my way of dealing with the struggles happening in my life. I remember having the complete songs of Genesis and playing it over and over again. It will be very great if the band still continues to write new amazing songs! This blog is really nice, it gave me a feeling of nostalgia.